Learn how to talk about past events that have finished. 이 중국 이야기를 듣고, 과거에 일어났던 일들을 말할 때 쓰는 단순 과거형, 즉 'the past simple'을 사용하는 방법에 대해 배워보겠습니다. 이번 이야기는 중국에서 왔는데요. 어린 시절부터 친구로 지내다, 커서 장군이 되는 두 사람의 이야기입니다. 이야기를 듣기 전에, 여기 등장하는 단어와 구문들을 알고 있는지 먼저 확인해 보실까요. 이야기를 들으며 이 질문들에도 대답해보세요. 1. 주티와 리우쿤은 어떤 꿈을 함께 갖고 있었나요? 2. 두 사람은 어떻게 검술을 연마했나요? 3. 이야기 마지막 부분에서, 진 왕조엔 무슨 일이 일어났나요? 상황이 마무리된 과거 사건에 대해 이야기하는 법을 배워볼게요! 안녕하세요? The Storytellers에 오신 것을 환영합니다. 저희 프로그램에서는 전세계의 이야기들을 들어보고 영어도 배우는 시간을 가지고 있습니다. 저는 손보람입니다. 오늘의 이야기는 ‘닭만이 볼 수 있는 것’에 대한 건데요. 중국에서 온 이야기 입니다. Zu Ti 와 Liu Kun이라는 두 장군에 대한 이야기인데요. 어렷을 적 부터 친구인 두사람은 그들의 ‘land’ 영토에 ‘invaded’ 침입한 ‘barbarians’ 오랑캐들과 맞서싸우는데요. 이야기를 듣기 전에 여러분의 이해를 돕기 위한 단어 몇개를 알려드릴게요. ‘Dynasty’ 왕국, ‘abandon’ 포기하다, ‘sword fighting’ 칼싸움.. 입니다. 자 이제 잘 들어보고 Zu Ti와 Liu Kun의 꿈은 무엇이었는지 맞춰보세요. The 3rd & 4th centuries were a difficult time in China. The Jin Dynasty ruled the land, but Barbarian invasions caused its people to be very unhappy, so the Jin Dynasty abandoned their country and travelled far away. During that time, a boy named Zu Ti was born, and as he grew older he decided to study sword fighting. Zu Ti and his childhood friend, Liu Kun, cared a lot for their land, and they shared the same dream of fighting the Barbarians and working for the Jin Dynasty one day. 자 잠시만요. 자 오랑캐가 진나라를 공격했고 결국 진나라를 영토를 포기했네요. 조국과 국민이 고통받는 것을 보고 Zu Ti와 Liu Kun은 오랑캐와 맞서서 진나라를 다시 세우는 꿈을 꿨습니다. 이 이야기의 배경이 언제인지 기억나시나요? 3세기와 4세기라고 했습니다. 자 이 모든 일들이 이미 일어난 일들이죠? 이렇게 과거 일을 얘기할 때에는 단순 과거형을 사용합니다. 이야기에서 나왔던 예시를 몇개 살펴볼까요? The Jin Dynasty ruled the land, but Barbarian invasions caused suffering for its people, so the Jin Dynasty abandoned their country and travelled far away. ‘Ruled’ 통치했다, ‘caused’ 야기했다, ‘abandoned’ 포기했다, ‘travelled’ 이동했다.. 모두 단순 과거형이죠? 자 모두 중요한 사건들이고 이미 끝난 일들이며 언제 일어났는지도 아는 일들인데요. 동사 기본형인 ‘rule’, ‘cause’, ‘abandon’, ‘travel’ 끝에’-ed’를 붙여서 단순 과거형을 만들었습니다. 이렇게 표준 규칙을 따르는 동사들은 -ed를 마지막에 붙이면 과거형이 되죠. 자 이제 다음에 무슨 일이 있었는지 이야기를 계속 들어볼게요. 몇 개 단어를 알려드릴게요. ‘Rooster’ 수탉, ‘crow’ 울다, ‘defeat’ 물리치다..자 Zu Ti와 Liu Kun이 꿈을 이뤘나요? 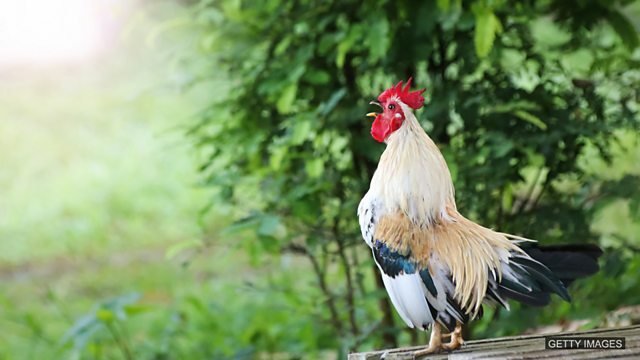 One night, as they were sleeping, Zu Ti was woken up by the noise of a rooster. He kicked Liu Kun awake and suggested that any time they heard the rooster crow, they get up and practise sword fighting. Liu Kun agreed and they started to practise. Over time, as they worked and practised each morning, they improved until they were excellent fighters. Soon, their dreams became true. Zu Ti and Liu Kun served as generals for the Jin family and defeated the Barbarians in many battles. Together they helped the Jin Dynasty return to China, showing that their hard work changed their land. 자 오늘 배운 단어로 여러분이 했던 일에 대해 말할 수 있나요? 한 번 시도해보세요. 오늘 이야기는 재미있었나요? 오늘도 The Storytellers와 함께 해주셔서 감사합니다. 다음주에는 또다른 이야기와 함께 영어공부해요. 바이! Tell us about something that happened to you in the past! Did you practise anything? Did you have any dreams like Zu Ti and Liu Kun? Come and tell us in our Facebook group! 과거 여러분에게 일어났던 일들에 대해 말해보세요. 무언가를 배운 적이 있으셨나요? 주티나 리우쿤처럼 어떤 꿈을 갖고 있으셨나요? 저희 페이스북에 놀러오셔서, 함께 이야기해봐요. Join us for our next episode of The Storytellers, where we listen to stories from around the world while learning English. The Storytellers 다음 시간에도 세계 여러나라의 이야기를 들으며 영어공부 해보아요.